Bridal shower special touches include all the "unnecessary extras" that will add to this event. These ideas that will work for most brides. You can also add specific details for "your" guest of honor. Though not a requirement, they will add to her memories. Special touches might include one or more of the following listed below. *** Do you have a bridal shower special touch idea? Share it! • Many guests will have "words of wisdom" to offer. You can include an advice card in the invitation, and ask each guest to bring it to the party. You can also have them fill it out at the shower. The advice cards are then collected and given to the bride. This has become a tradition at many wedding showers. A large decorative container is used. Guests are asked to bring a small useful item, in addition to their main gift. This helps the couple accumulate all the necessary household gadgets. • The "Here Comes The Bride" sash in the picture above, can be personalized with a special saying. Drape it over her chair until she arrives. Then she can wear it throughout the party. You may also decide to great her at the door with it. • The bridal shower umbrella is a recognizable symbol of this event. Try to include this tradition in your plans. This floral piece can be purchased or homemade, in the wrist or pin-on types. You can incorporate the bridal shower colors, or the bride-to-Be's favorite colors. If possible, select her favorite flowers. Have a special chair designated for the guest of honor. Decorate with balloons and streamers for a casual party. Add a special designer covering, for a more formal event. The bride-to-be can sit here while opening her gifts. Place in a central location, to be seen easily, by all guests. 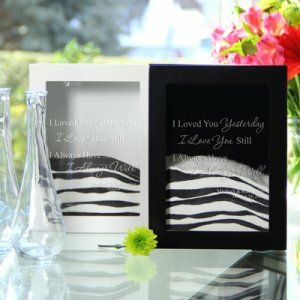 • This shadow box unity kit would make the perfect bridal shower gift. It can be personalized with the couples names or initials, and the date. This keepsake set is available in black or white. The package includes 1 small wood box, and 2 pouring vases. • Assemble a shadow box using items related to the party. You could also do a honeymoon, friends, or family theme. • Bridal shower guest book: sit out a book for guests to sign and offer best wishes. It is a good idea to have them do this as they enter. This is a bridal shower special touch that she will treasure forever. • A bridal shower keepsake gift registry will provide a written memory of guests who attended the shower, and gifts received. • A bridal shower scrapbook commemorating the party's events, is sure to be cherished. Purchase a special box of candy, such as Godiva chocolates, just for the bride. Wrap as an extra surprise. This can be given to her to take home and enjoy. • Serve champagne and toast the bride/couple. This is always a special idea. *** This is available without alcohol, if desired. Every girl loves to receive roses. These can be part of the decorations during the party, or presented to her as she is leaving. Either way, they are hers to keep. • Flowers from friends: an alternative to the bouquet of roses listed above, ask each guest to bring one flower. Have a vase near the entrance, so that guests can insert their flowers. Give the colorful bouquet to the bride, to take home. *** Bridal shower special touches are just one more way for you to make this event a special one. Do you have a bridal shower special touch idea? Share it! Please give your special touch idea a title. • Go from bridal shower special touches to the homepage.